Hi friends! I hope you are having a fabulous day! I'm having a really rough morning. We had yet another hard drop off at school with Brady today and I'm just bummed out. I was planning on trying to get some work done but I'm SO sad right now. I think I'll be able to get things done after we go pick him up and I get to see that he ended up having a great time at school. Today, I'm sharing the card I made for my sister in law, Deanna, for her bridal shower invites. She's getting married next month! :) She's super sweet and I was glad to do these for her. I made about 32 of these but I forgot to photograph them all together so you get to see ONE. But you get the idea. 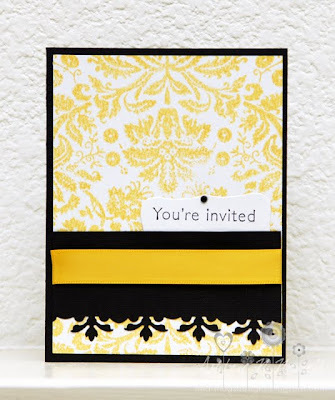 Deanna choose mustard, black and white for her colors and she's using a damask theme. I decided to make the invites match the colors and theme. The background was made with a Hero Arts background stamp and some Distress Ink in Scattered Straw. I used an EK Success punch for the edge and Spellbinders Labels 8 for the sentiment. I added ribbon and a gem to embellish. She wanted this pretty simple and I think I achieved both an elegant yet refined look here. I'm sorry that you are having a tough time. I think I'd be the same though. Hugs! 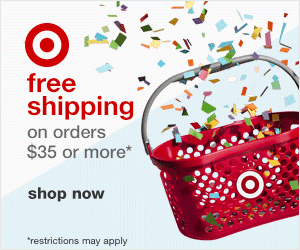 Your invites is gorgeous! Your stamping makes the paper look like ab Authentique designer paper!! Love the design and punches!! This is stunning, so elegant & classic!!! A great way to use the labels 8 dies! I'll have to try this!